The 2019 USAFF Online Qualifier will take place from April 24th 2019 to May 6th 2019. The top 30 Individual Men, top 30 Individual Women, and the top 10 Master’s Men and top 10 Master’s Women in the 40-44 and 45-49 categories will earn a spot to compete at USAFF Nationals on June 15-16th in Chesapeake, VA.
To compete in the qualifier and at USAFF Nationals you must be a USAFF member. You can become a USAFF member here. 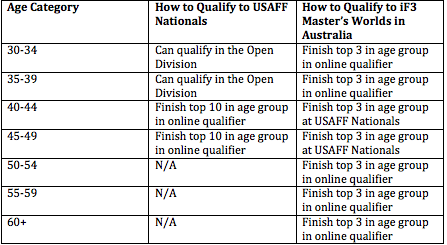 For more information about USAFF Nationals and various qualifying routes to Nationals click here. All tests for the online qualifier will be released on April 24th 2019. Athletes will have until May 6th to complete and submit scores for all tests. Registration will open in early 2019. Stay tuned for a registration link.